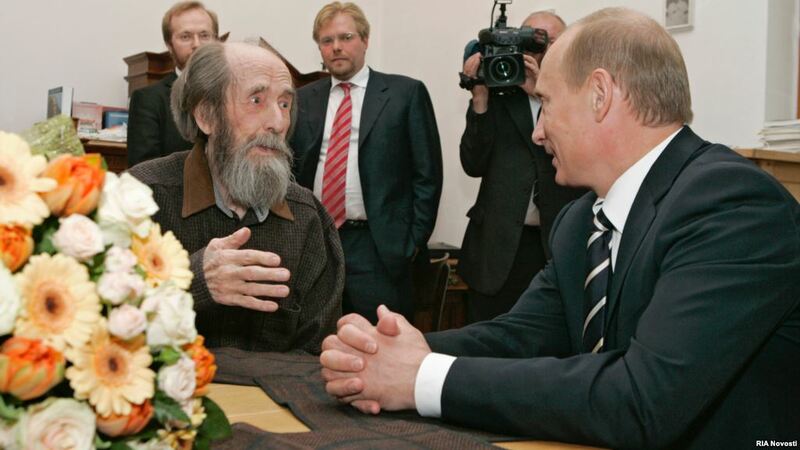 Putin gives Solzhenitsyn an award for his work in 2007. Source: RIA. In the eyes of Western mainstream opinion-makers—that is, in the Anglosphere, specifically—at best, Solzhenitsyn’s support for Putin made him a “puzzle.” At worst, his patriotism, referred to as “nationalism” with a derogatory connotation, is said to be “off-putting,” “bizarre,” and an “irony.” Newsweek even presented a ‘psychological evaluation’ of Solzhenitsyn, concluding that he suffers from the “Gulag of the Russian mind.” Indeed, it has become increasingly difficult to use his scathing criticism of certain Soviet policies in light of his advocacy for Russia’s own organic path that includes a set of geopolitical interests. The latter was dubbed as anti-Western. The final straw seems to have arrived following Ukraine’s coup d’état in 2014 that was backed by Washington and Brussels, when several Russian-language publications decided to revisit Solzhenitsyn’s statements about the two neighboring countries made throughout his life. A number of his comments has been translated into English, and are well worth examining. Solzhenitsyn felt greatly attached to this subject because “Ukraine and Russia are merged in my blood,” he wrote. I provide another translation of excerpts from a book called Russia in Collapse (Rossiia v obvale, 1998) below. Unsurprisingly, Western officialdom found his goal of returning to a historic union of Russia and Ukraine highly problematic. Others simply criticized his statements for being uninformed, suggesting that writers should stay away from international relations. But the “irony” that the mainstream opinion-makers in the West described was actually on them: Solzhenitsyn was, in fact, consistent in his critique of the Soviet nationalities policies that, at times, divided regions administratively, without accounting for their ethno-cultural makeup. This was the case with Crimea and Donbass, the tragic results of which have become too obvious in the past year. Falling out of favor with Cold Warriors and their heirs alike, one might reconsider the Archipelago itself. While this massive text undoubtedly has both literary and historic value, it cannot be used for statistical analysis by definition. After all, it was, in part, based on eyewitness testimony and available Soviet legal decrees, rather than those documents that only became declassified after 1991. Neither can this text be employed to describe the entire Soviet era or, for that matter, contemporary Russia, the way propagandists do with their persistent Putin-Stalin trope. Looking to understand that turbulent period, paradoxically both tragic (from collectivization to the purges) and triumphant (from industrial feats and increased literacy to the elimination of childhood mortality and epidemic diseases, to say nothing of the Great Patriotic War), one is best to go directly to factual archival data compiled by historians rather than falling for the deliberately exaggerated claims by those who seek to use this author to undermine Russia. The following excerpts from “Slavic Tragedy” (Slavianskaia tragediia), a chapter in Russia in Collapse, will demonstrate why some journalists in his homeland referred to Solzhenitsyn’s words—from his comments about the Church to the question of language—as “prophetic.” And why the West’s favorite Soviet-era dissident has become so geopolitically inconvenient as of late will also become clear. In terms of autonomous development—may God grant Ukraine every success in this endeavor. Its grave mistake lies specifically in its excessive expansion into those lands that were never Ukrainian prior to Lenin: two Donetsk regions, the entire southern strip of Novorossia (Melitopol-Kherson-Odessa), and Crimea. 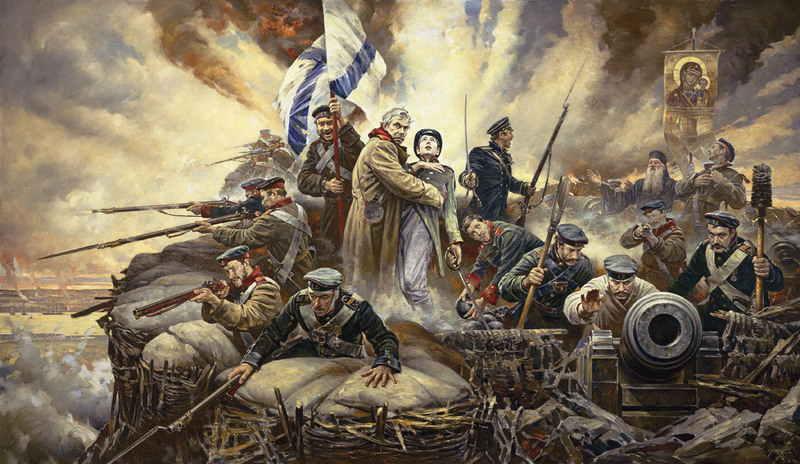 “Defend Sevastopol” by Vasilii Nesterenko, 2005, marks the 150th anniversary of the city’s defense. Pushing out the Black Sea Fleet from Sevastopol is the lowest, evil abuse of the entire Russian history of the 19th and 20th centuries. Under all these conditions, Russia cannot dare indifferently betray those millions of Russians in Ukraine in any shape or form, or renounce our unity with them. 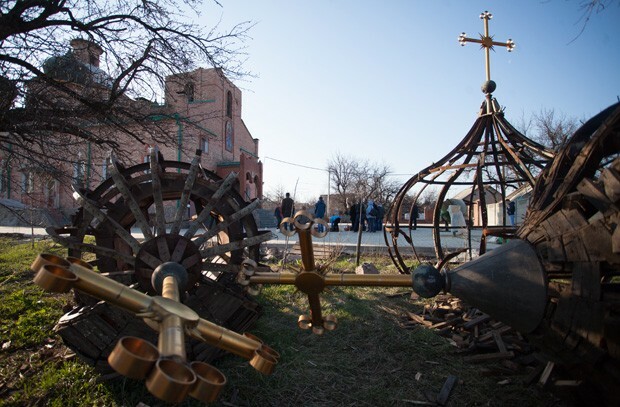 One of the many churches destroyed during the 2014-15 war in Donbass. Source: Donetsk, Mikhail Sokolov, TASS. The fanatical suppression and persecution of the Russian language (which the previous polls demonstrated as the main language for more than 60% of the population) is a brute measure, one that is directed against the cultural prospects of Ukraine itself. Even the ethnic Ukrainian population does not speak or use the Ukrainian language under many circumstances. Thus, there must be measures of transferring all nominal Ukrainians into the Ukrainian language. Then, there will obviously be the task of making Russians use the Ukrainian language, too (and this already—not without violence?). Then, the Ukrainian language is yet to vertically sprout into the upper strata of science, technology, and culture—this task is ahead, too. Furthermore, the Ukrainian language must become mandatory in international relations. Perhaps, all these cultural tasks might need more than a single century. For now, we are reading the news about the persecution of Russian-language schools, even thuggish attacks on Russian schools, about ceasing to broadcast Russian television in certain places all the way through to the ban on the Russian-language use between librarians and readers. Is this really the development course of Ukrainian culture? Ukraine’s anti-Russian position is precisely what the United States needs. Ukrainian government subserviently plays along with the American goal of weakening Russia. And this [strategy] quickly reached the “special relationship of Ukraine with NATO” and the US navy exercises in the Black Sea. One is forced to recall Alexander Parvus’s [Marxist revolutionary—Ed.] immortal plan of 1915: using Ukrainian separatism to succeed in breaking up Russia. Tempo fa cercai in libraria un libro, molto bello, di Solzhenitsyn, il dissidente russo autore di “Arcipelago Gulag”. Un testo straordinario che racconta tutto il dramma di una realtà dispotica, burocratizzata e assistita, sin quasi alla perdita di ogni gioia o interesse per la vita. Non ne trovai traccia, non si ristampava da più di un decennio. Questo articolo, assai interessante, spiega i tanti perché del dimenticatoio. Collocando la figura dell’autore nel contesto geopolitico e culturale dei rapporti fra est ed ovest. As I was reading the Solzhenitsyn quotes I kept thinking the were your comments since they were so contemporary. A testament to his prescience. did not suit those that would rather have the country in the permanently weak state of ‘freedom’ and ‘democracy’ of the 1990s, so that its resources could continue being plundered by domestic oligarchs and foreigners alike, while its culture–transformed into the soft authoritarianism of neo-Liberal Postmodernity. That pic of Solzy & Putin rings true.